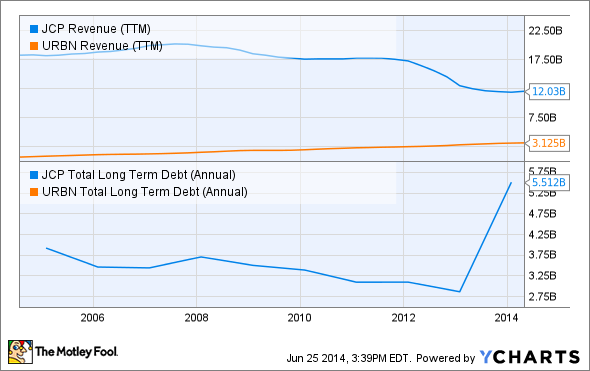 J.C. Penney still has the same mountain of debt, though it is on better terms. The reality is, more store closings are coming, and the company is racing against time to get to breakeven. A better investment? Urban Outfitters. Despite what you might be reading out there, struggling retailer J.C. Penney's (NYSE:JCP) new credit facility is absolutely a positive, very good thing for the company, and good for shareholders. It reduces expenses via lower interest rates, and it also gives the company breathing room to get to breakeven. This is great news. Consider how incredibly critical I've been of Penney's leadership and board of directors for an incredibly destructive series of actions over the past several years when I say that they got this one right, and that it wouldn't have been possible if not for some very hard decisions to staunch the bleeding. But even with the improvements, Penney isn't a good investment, especially in the face of a changed retail landscape. Looking for a "turnaround" play? You're better off with Urban Outfitters (NASDAQ:URBN). Let's talk about why. The reality is, J.C. Penney still has a long way to go, and despite the financial improvements, the 800-pound gorilla remains: relevance. Urban Outfitters has recently experienced the challenges that the fashion world can bring, as same-store sales (comps) at the company's namesake brand declined by a scary 12% last quarter. Urban Outfitters has three key brands, and Anthropologie and Free People both reported strong comps of 8% and 25%, respectively. Combined, Anthropologie and Free People made up almost 60% total sales. They're popular brands with the 30-and-under women's crowd, an incredibly important demographic for retail clothiers. I'll admit it: The sales trend at Urban Outfitters isn't good, especially when it's been going on for a year. But the fact that Anthropologie and Free People continue to grow at astonishing rates means that management has time to right the ship at Urban Outfitters. How strong are the results at Anthropologie and Free People? Strong enough that comps for the entire business grew 6% last year. That's what relevance looks like. The best part? There's a lot of room for growth, with only 190 Anthropologie and 92 Free People retail stores open. Even the flagship Urban Outfitters brand has fewer than 250 retail locations. Penney, on the other hand, has 1,100 locations, is closing at least 60 underperformers, and is doing things like the renegotiated credit facility in an effort to reduce costs. Don't get me wrong -- these are smart, necessary moves, but they don't address the company's lagging sales results. Sure, Penney reported comps growth last quarter, and over the holiday shopping period, but it's still well short of the sales levels from 2011, and nowhere near the all-time highs back in 2007. Sure, the economy isn't as strong as we want it to be, but consumers are beginning to buy again. They're just not going to J.C. Penney. JCP Revenue (TTM) data by YCharts. 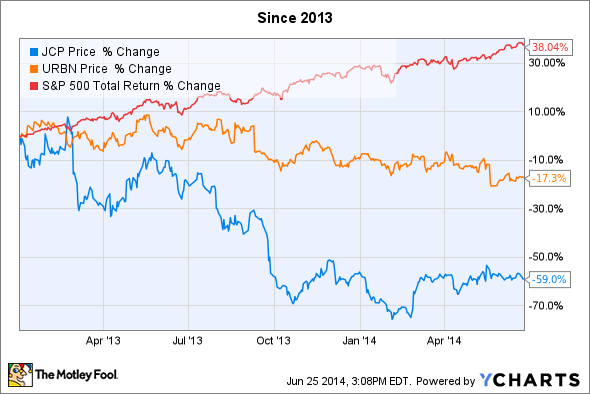 Penney simply has a long way to go, and the risk for investors remains quite high. The reality is, even with the improved (read: less bad) results in recent quarters, and the narrowing of losses, Penney has a much bigger long-term problem than debt and tightening up its financial standing. If it can't re-establish itself as a destination that consumers are drawn to, all of the cuts in the world are just so much window dressing. Factor in all that debt, and shareholders are at risk of total losses if sales growth doesn't accompany the financial improvements. Urban Outfitters' brands are about more than clothing and apparel. Source: Urban Outfitters. Urban Outfitters, on the other hand, is in a much better position. It has two strong brands that are growing like crazy, and a solid balance sheet with essentially no debt. Throw in a strong, founder-led culture, and the company has time to turn the struggling Urban Outfitters brand around. With the share price down more than 20% over the past year, management has started buying back shares on the cheap, while Penney had to sell more shares -- giving shareholders a 39% bath -- just to stave off creditors and suppliers. 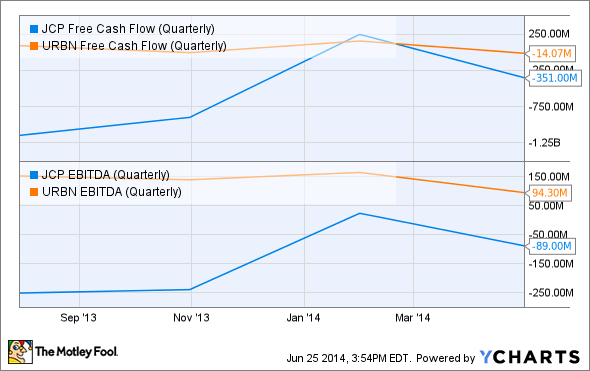 JCP Free Cash Flow (Quarterly) data by YCharts. Earnings are a product of both efficiency and sales volume, and in retail, sustainability is largely a product of your brand image, and attracting a customer base, and there's just not any clear evidence that Penney has achieved that again. Urban Outfitters, however, clearly does have brand appeal, and an opportunity to grow. Add in a rock-solid balance sheet, and a founder-CEO with a huge personal stake in the company, and there's a lot to like. Which is the better investment? Unquestionably, Urban Outfitters.